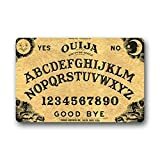 This Halloween, attempt to communicate with the dead, chatty demons, or just the average trick-or-treater standing in front of your doorway with this cool new Spirit Board Door Mat. 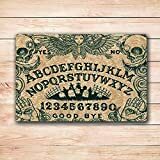 This clever Ouija board-inspired doormat looks just the real thing with a thick hand-hooked pile designed to resemble wood grain along with elements such as the standard HELLO and GOODBYE (perfect for a doormat), YES and NO, alphabet, and spooky graphics and symbols. 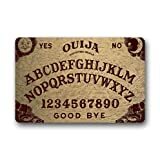 If all goes right, I guess whomever may be standing on it will act as the planchette and get moved around involuntarily by supernatural forces to spell out answers. If nothing else, it also doubles as a spooky functional doormat perfect for the Halloween season.